What would you do if you and your friends were trapped on a wooded island with no way to get off? It is the early 80s, so there are no cellphones to call for help even though civilization is just hops away. The only inhabitant on the island appears to be a homeless woman who is creepy as hell, but she offers you shelter and food and is an excellent cook. It’s an unsettling situation for sure, but manageable if everyone keeps just calm and waits for rescue. For public health graduate student Karalee and her four companions though, the island may be their last resting place. They are on one of the lonely islands in the Hell Gate section of New York’s East River, where for centuries civilization locked away those they feared the most. The shelter the five friends find is an abandoned old hospital, once used for quarantining victims of infectious diseases. One of its most famous patients was a woman named Mary Mallon—the Irish cook better known as Typhoid Mary. Karalee didn’t end up at the island by accident. Her great-grandfather was George A. Soper, the sanitation engineer who was the one who discovered Typhoid Mary and finally captured her after she infected and killed people with her cooking. Karalee and her friends were out boating on a beautiful summer day when she spies North Brother Island, and immediately feels drawn to the place because of her family’s history. But when their boat becomes damaged by the unyielding currents of the river, the youths are marooned and are forced to spend the night with the old homeless woman to provide for them. The woman, grimy as she is, proves to be a wizard when it comes to whipping up meals for her stranded guests. She tells Karalee and her friends that her name is Mary, and a slight Irish accent marks her speech. Coincidence? Or is there something more sinister at play here? 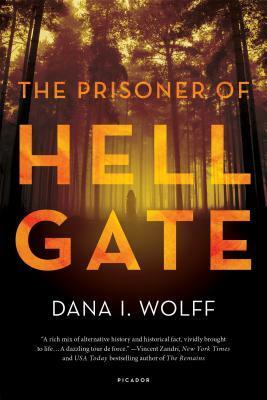 Dana I. Wolff’s The Prisoner of Hell Gate is set up like your classic slasher horror scenario: a group of twenty-somethings find themselves trapped in an isolated place with a crazy killer on the loose determined to pick them off one by one. But there’s a twist here. Instead of relying on a copious amount of blood and gore to scare her readers, the author uses our deep-seated fear of germs and gruesome infectious diseases to create horror. And rather than a knife-wielding psychopath, the villain in this tale is a madwoman whose weapon is much more nefarious and repulsive. Who was Mary Mallon, exactly? The media of the early twentieth century dubbed her Typhoid Mary, for being identified as an asymptomatic carrier of typhoid fever. Working as a cook, she managed to infect dozens of people and was isolated not once but twice by public health workers, after she changed her name and returned to being a cook even though she was ordered not to upon her first release. I’d heard of her before reading this book, but wasn’t aware of the specifics of her life or the circumstances around her arrest and quarantine. On that front, this book was very informational. I learned about the cat-and-mouse game between Mallon and Soper as the latter traced the trail of infection all across the city in order to finally apprehend her. The story contains many flashbacks to the past, including a recounting of the General Slocum disaster of 1904, when the steamship caught fire and sank in the East River taking with it the lives of more than a thousand men, women and children. The Prisoner of Hell Gate is not a historical novel per se, but those who have an interest in these history subjects will probably find its premise intriguing. The plot, however, is pretty textbook. The cast is gradually whittled down as one by one they fall prey to the killer. It’s a timeworn device, but to Wolff’s credit she manages to apply it in a quick and suspenseful fashion, even though none of her hopped up, foolish and arrogant characters are all that likeable, which robs their deaths of the desired effect. Karalee is especially annoying with her stubborn defense of Mary Mallon, even though she knew full well all the people Mallon infected and her subsequent lack of cooperation with the authorities. There’s a personal reason for Karalee’s strange sympathies, but they weren’t very well developed. The best character was probably the mysterious Mary. Her narrative is disturbing, but the complexity with which she is written is utterly fascinating. For my review, I left parts of the story deliberately vague, because I think some of the most unexpected surprises are best left for readers to discover on their own. I wouldn’t go into this book expecting it to shake up the genre, but it had its moments, not to mention some cool twists. It probably could have been scarier it weren’t for the man missed opportunities to play up the terrors of infectious diseases and outbreaks, but there is a supernatural aspect here that I thought was well incorporated. All in all, The Prisoner of Hell Gate was an entertaining read. I would recommend it if you’re looking for a fast-paced, mainstream-type horror read, especially if you have an interest in the history of Typhoid Mary. why not, the idea is interesting in a whole so I confess that I’m curious. I’d pick this one up and check it out on the title alone, but your review is even more encouraging! It was different for sure. Imagine a slasher horror film…but with disease. Fascinating. I heard of Typhoid Mary, of course, but was not aware of the finer details of the story: for this alone I think this would be a great read, and for the other historical references. I love books that make me search for further context! I like the historical references and like Maddalena I’ve heard of Typhoid Mary before but didn’t really know much about her! Sounds quite good so long as you go into it with the right expectations – so maybe not going to break any moulds but entertaining nonetheless. Haha…I must have read more horror in 2016 than I did in the last three years. It’s a pretty big year for the genre.